Who else has been watching Christmas movies every night since December kicked off? Guilty. I have so many favorites that it’s hard to fit them all in! The countdown is on for a much needed break and I couldn’t be more excited to head home for Christmas! We are leaving next week for Florida, but first we are going to be staying at Edgefield next Tuesday for my birthday! It’s an amazing property right outside of Portland with a quaint hotel, thermal soaking pools, and lots of cozy restaurants and bars on-site! I’ll definitely do a post on our stay! I am all for Christmas cookies, but sometimes you just need a good slice of chocolate cake. 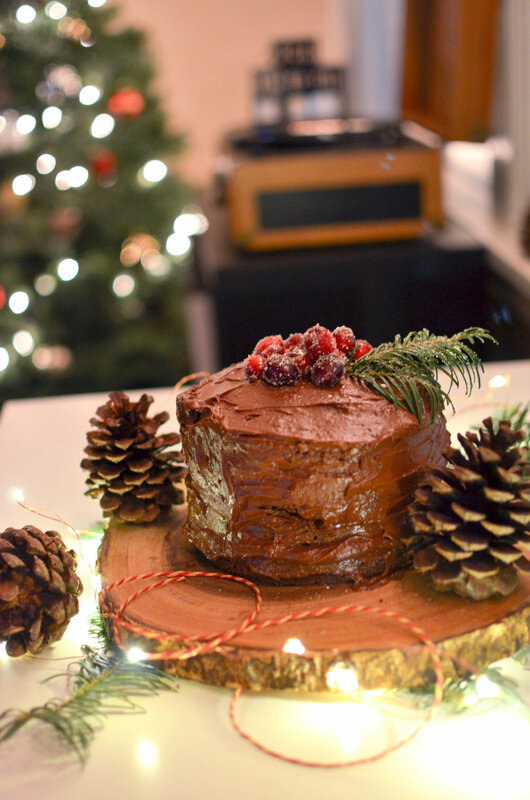 You can’t go wrong serving up rich and decadent chocolate cake, and it’s easy to make festive with greenery and sugared cranberries! I adapted this recipe from Broma Bakery - she’s seriously a cake wizard. I used cocoa I had on-hand, but if you want to make it a “black-out” chocolate cake, you’ll need to use dark cocoa.